A proposed offshore wind turbine field in Hawaii could generate 30% of the energy needs of Oahu, the state’s most populous island. But there's a long way to go before windmills are spinning. 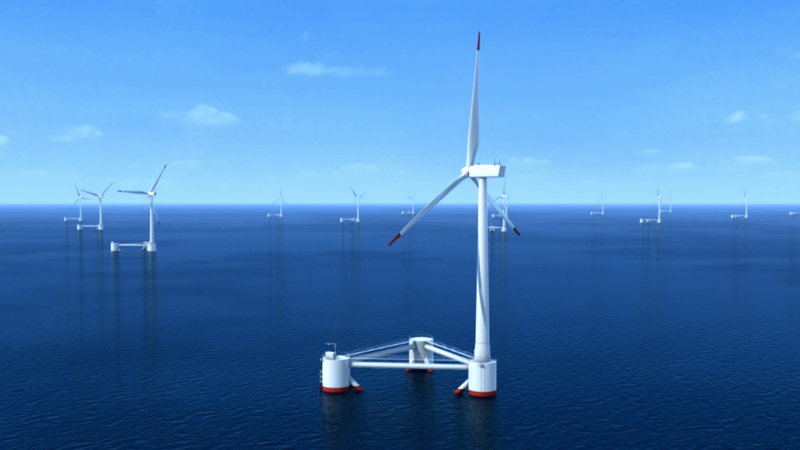 The $1.6 billion project, which is being developed by a Danish energy company, would place more than 100 turbines off the coast of the island. The turbine idea will get its first step through what will likely be a long regulatory process at a meeting of the Intergovernmental Renewable Energy Task Force in Honolulu today. Hawaii has set a goal of generating 70% of its energy from renewable sources by 2015 and generating 100% from renewable sources by 2045. That's ambitious: Imported fossil fuels are currently responsible for generating 90% of Hawaii’s power, according to Hawaiian Electric, the state's largest energy company. But on Oahu, home to the city of Honolulu and 75% of the state’s population, there’s little land available to build the types of turbines needed to make wind power a significant portion of that strategy. That’s what makes offshore turbines so important, says Alpha Wind, the company behind the proposal. “It is most definitely, from all aspects, the most complex and difficult project that has ever been proposed in the wind industry,” Jens Petersen, Alpha Wind’s CEO, told Fusion. Under the proposal the company submitted to federal regulators, 102 turbines stretching 300 feet high would be placed in two areas of the ocean off the island’s northwestern and southern shores. Underwater cables would transmit a total of 816 megawatts of electricity back to Oahu from both the wind farms. Petersen and Alpha Wind have spent 10 years researching the project, he said. The breakthrough came three years ago in the form of WindFloat, a technology that allows networks of turbines to be floated and kept steady enough to produce energy. That way, offshore turbines don’t need to stretch all the way down to the bottom of the ocean. But the final specifications for the project are yet to come. Petersen said Alpha Wind will work with locals throughout the development of the project and that the regulatory approval process will take three years at the very least. So he has some time to figure that out. The Danish company will likely face local opposition to at least parts of the project, said Henry Curtis, an environmental advocate who's studied energy in Hawaii for 20 years. "I don't think the one on the north is going to fly," Curtis told Fusion. "On the north shore, the community there is riled up about wind," after fighting with a developer building a land-based wind farm there. Solar power will also likely be cheaper in sun-drenched Oahu by the time the wind farms would flip the on switch, he said. And Alpha Wind may also face competition—another developer is planning to submit a proposal for an offshore wind farm near the island, Curtis said, but declined to give more details. Offshore wind is a big deal in Europe—turbines generated 39% of Denmark’s total energy last year, many of them offshore. But the industry is still in its infancy in the U.S., where offshore projects have attracted controversy. A plan to build 137 turbines off the coast of Cape Cod, Massachusetts, currently in progress, has faced cost overruns and protesters worried about ruined ocean views.